This was originally posted as part of a series called “Pliable Programming” on the De Novo Elements platform. In Part 2 of this series we will examine one of the primary programming variables which drive the fitness side of the fitness-fatigue model discussed in Part 1. First, let us review the primary objectives in achieving an effective training stimulus. We are seeking muscle recruitment, skill acquisition, and enough exposure to this level of recruitment to impose the desired training stress. What tools in our programming toolbox are we able to manipulate to achieve these objectives on the physiological level? In this post, we will cover intensity and the basics of how it contributes to the training effect. Absolute intensity is commonly considered the percentage of 1 rep max, which provides an absolute load on the bar. Relative intensity refers to how close a set is taken in proximity to failure. RPE (Rating of Perceived Exertion) and RIR (Repetitions in Reserve) are both subjective methods commonly used to effectively gauge the proximity to failure as rep speed decreases 1. Both absolute and relative intensity are valuable tools to achieve our objectives of sufficient muscular recruitment and skill acquisition. 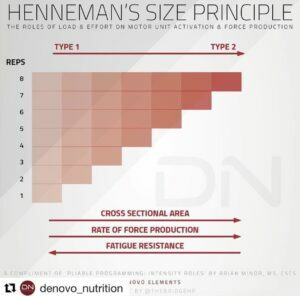 However, before we delve into the practice of altering these variables, let’s first address a core principle of muscular recruitment; the size principle. What is the size principle? Henneman’s size principle stipulates that progressively larger motor units (MU) are recruited on an as need basis as demands increase. MUs which control the smaller, more fatigue resistant Type I fibers are generally recruited first with the additional recruitment of MUs controlling Type II muscle fibers coming into play as demands increase2. Type II fibers have a greater cross sectional area and rate of force production than Type 1 fiber types but are less fatigue resistant. From a survival standpoint, this makes sense; we make use of the fatigue resistant muscle fibers as much as we can out of the gate and ramp up as needed. With increases in absolute intensity, MU recruitment increases to meet the increased demands3 4 5. For example, lets say your 1RM for squats is 400 lbs. 90% of 1 RM (360 lbs) will require a greater level of effort and thus MU recruitment out of the gate than 60% (240 lbs). However, there appears to be points of intensity beyond which no additional motor unit recruitment is observed. In a more positive light, that means full recruitment has already occurred. This seems to take place somewhere between ~80-90% of maximal effort depending on the exercise and muscle groups being worked3 4 5. Smaller muscle groups tend to have a lower maximum recruitment threshold and thus rely more on increases in firing rates to meet force demands, while larger muscle groups tend to have higher maximal recruitment thresholds before they lean on increased firing rate to further increase force production6. With increases in relative intensity (pushing a set closer to failure), MU recruitment increases to maintain the force demands as muscle fibers become fatigued7. As in our previous example when discussing absolute intensity, let’s say you took the 60% set of squats to failure. With each additional rep, the demands to maintain force production increase due to fatigue, even though the resistive force doesn’t change. To meet these increased demands motor unit recruitment is increased and/or firing rates increase. With that said, some data indicates a greater level of MU recruitment when higher intensities taken to failure vs lower intensities to failure7 8. Together, we can likely assume that maximal muscle recruitment requires the inclusion of sets performed at/beyond a certain level of absolute intensity, and/or are pushed to high(ish) relative intensities. While higher absolute and relative intensities carry a robust effect for muscle recruitment, precautions should be taken within a structured program to manage the fatigue/injury risk associated with these higher absolute and relative intensities (more on that later). From a skill acquisition standpoint, higher absolute and relative intensities with the competition lifts are most specific to meet conditions. After all, what is more specific than a single at RPE 10? This reinforces the adage that “strength is a skill” as the manner in which we execute a lift can change with increasing intensity 9 3 10. While the optimal amount of exposure to high intensities for skill acquisition is going to vary person to person, the inclusion of high(er) specificity intensities is fairly common practice for a peaking powerlifter as they gain skill and confidence under heavy loads. As a reminder from Part 1, every programming variable that drives up the ceiling for strength capacity also contributes to fatigue that masks its actual expression. Over time, this expression of strength is just as important in the gym as it is on the platform. 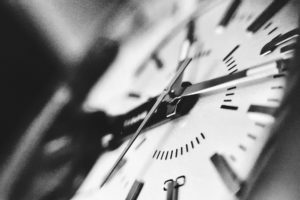 Therefore, not only does optimal fatigue management/programming allow us to more effectively display our strength over time, it also allows us to more effectively raise its ceiling to begin with. In practice, we want to provide an effective stimulus for adaptation while avoiding superfluous fatigue along the way. In future parts of this series will conceptually examine how training volume and frequency impact the training stimulus, attempt to define the primary variables that influence fatigue, and provide some takeaway recommendations. We will also touch on some cool ways you can manipulate these training variables to achieve an effective training stimulus while minimizing fatigue, so you can not only perform your best on the platform, but throughout your training career. Zourdos MC, Klemp A, Dolan C, et al. Novel Resistance Training–Specific Rating of Perceived Exertion Scale Measuring Repetitions in Reserve. J Strength Cond Res. 2016;30(1):267-275. doi:10.1519/JSC.0000000000001049. Carpinelli R. The size principle and a critical analysis of the unsubstantiated heavier-is-better recommendation for resistance training (PDF Download Available). J Exerc Sci Fit. 2008;6(2):67-86. https://www.researchgate.net/publication/241485398_The_size_principle_and_a_critical_analysis_of_the_unsubstantiated_heavier-is-better_recommendation_for_resistance_training. Accessed July 16, 2017. Yavuz HU, Erdag D. Kinematic and Electromyographic Activity Changes during Back Squat with Submaximal and Maximal Loading. Appl Bionics Biomech. 2017;2017:1-8. doi:10.1155/2017/9084725. Pinto R, Cadore E, Correa C, et al. RELATIONSHIP BETWEEN WORKLOAD AND NEUROMUSCULAR ACTIVITY IN THE BENCH PRESS EXERCISE. Med Sport. 2013;17(1):1-6. doi:10.5604/17342260.1041876. Vigotsky AD, Harper EN, Ryan DR, Contreras B. Effects of load on good morning kinematics and EMG activity. PeerJ. 2015;3:e708. doi:10.7717/peerj.708. Masakado Y. Motor unit firing behavior in man. Keio J Med. 1994;43(3):137-142. http://www.ncbi.nlm.nih.gov/pubmed/7967308. Accessed July 16, 2017. Looney DP, Kraemer WJ, Joseph MF, et al. Electromyographical and Perceptual Responses to Different Resistance Intensities in a Squat Protocol. J Strength Cond Res. 2016;30(3):792-799. doi:10.1519/JSC.0000000000001109. Gonzalez AM, Ghigiarelli JJ, Sell KM, Shone EW, Kelly CF, Mangine GT. Muscle activation during resistance exercise at 70% and 90% 1-repetition maximum in resistance-trained men. Muscle Nerve. April 2017. doi:10.1002/mus.25509. Wilson GJ, Elliott BC, Kerr GK. Bar Path and Force Profile Characteristics for Maximal and Submaximal Loads in the Bench Press. Int J Sport Biomech. 1989;5(4):390-402. doi:10.1123/ijsb.5.4.390. Kellis E, Arambatzi F, Papadopoulos C. Effects of load on ground reaction force and lower limb kinematics during concentric squats. J Sports Sci. 2005;23(10):1045-1055. doi:10.1080/02640410400022094.